How to integrate with our payment partners and start invoicing your customers today. This guide documents billing management with Red Hat 3scale 2.3. In this tutorial you’ll learn how the 3scale billing system works and how to set it up. When setting up your billing configuration, you can choose between Prepaid and Postpaid. Prepaid mode: In prepaid mode, all fixed fees and setup fees are billed immediately at the beginning of the month or at the beginning of any pro-rated billing period. Variable costs are always calculated at the end of the month. Postpaid mode: In postpaid mode, all fixed fees as well as variable fees are billed at the end of the month. Here is a visual example of billing for the prepaid mode and for the postpaid mode. All paid plans are charged monthly. API providers who charge their customers for using their API service often need to charge the tax as well. This article will explain how 3scale billing system supports VAT. From the "new field" drop down select "vat_rate"
From the Account Management API, using the Account Update endpoint. If you want to update several accounts you will have to get them first using the Account List endpoint and then iterate over them updating the field. This could be combined into an automated flow using Webhooks to trigger your update requests when the Account is created or modified. VAT rate will be calculated and reflected in invoices. After completing these steps, you’ll have configured Adyen as a payment gateway for your account. This will allow your developers to enter their credit card details, and you can automatically charge them through Adyen for access to your API, according to the calculated invoices. Setting up your payment gateway is a key step enabling credit card charging for use of your paid API. There are a number of alternative payment gateways you can use with your 3scale account. Here we cover the steps for Adyen. Before you start these steps, you’ll need to open an account with Adyen. You need a Company account and a Merchant account within it (sub-account). There are a number of requirements that must be fulfilled before you can apply for a live account with Adyen. You can see what those requirements are here. 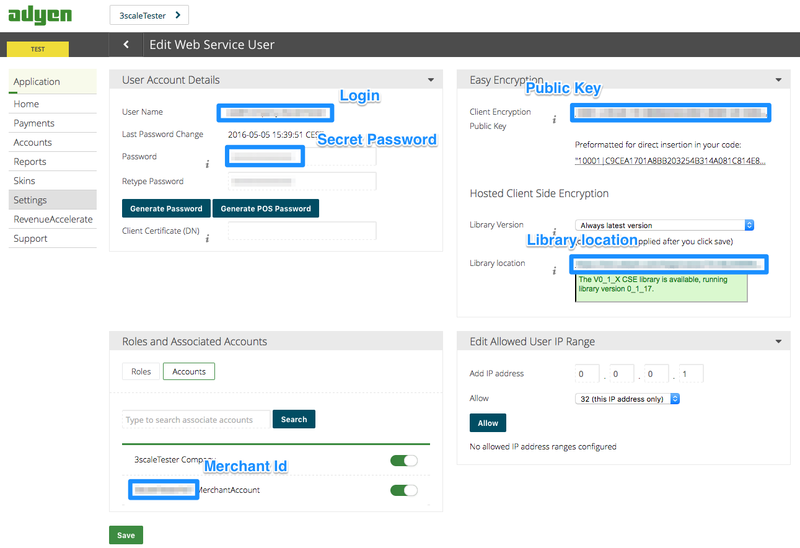 Finally you have access to the Login, Secret Password, Client Encryption Public Key, Merchant ID and Library location that you will need for the 3scale billing settings. To be able to view the Public Key, you must click on "generate password" and copy this password somewhere. In the billing area of the Settings tab, enable charging by checking the box and click save. You will see all the fields that you need to setup to create the link to your Adyen gateway. Remember to select Adyen from the gateway dropdown menu and save changes. By default when credit card authorization requests are sent from 3scale to Adyen, the returned response does not include the unique identifier of the credit card. To ensure that the correct credit card reference is saved in 3scale and the correct card is charged, this additional data needs to be enabled. In order to do this, you should ask Adyen support to enable the "alias" additional data in the response for the authorization request. Make sure you accelerate the test cycle by enabling Prepaid Mode to generate the charge within a day or so. 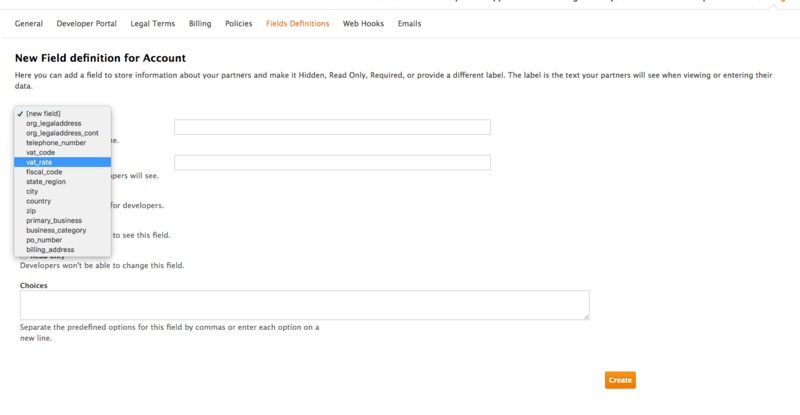 Then choose an existing test account and create an invoice with a line item charge added. Charge the account immediately. This testing approach will incur some minor costs, but it is worth it for the peace of mind that everything works fine, before you have real paying developers using your API. The payment gateway is now set up, but your users might not be able to use it yet since it is not configured in the CMS. 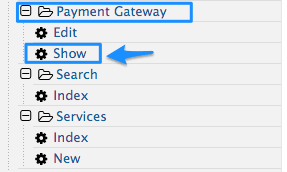 Go to the developer portal tab, and find the template called Payment Gateway / Show on the left navigation pane. For accounts created before 11th May 2016 you must add the snippet above manually. After said date this will be included in the template by default. If your account is in sandbox mode and you encounter any problems, you’ll have to change it to production. These are the steps to set up the Braintree gateway in order to to charge for use of your API. You’ll need to open an account with Braintree. You need a Gateway and Merchant account plus Vault. As an optional extra, you can choose to allow American Express cards as a payment method. 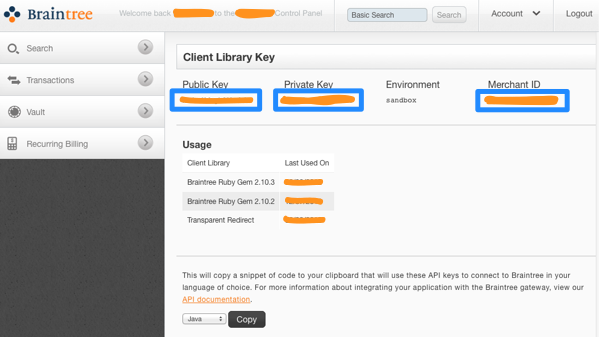 You need to tell 3scale to start using these API keys. 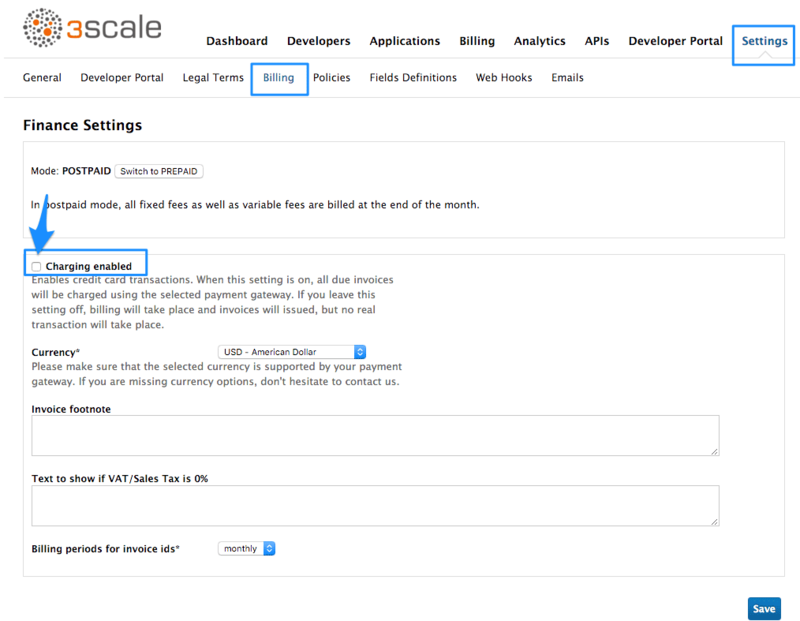 To do this, log in to your 3scale Admin Portal and go to Settings > Billing. If the Charging Enabled flag is not active, enable it and click Save. You should see a drop-down called Gateway near the bottom of the page. Change it to Braintree (Blue Platform). The form below the drop-down should change to show two fields. Insert your Braintree keys and click Save. You might see a couple of alerts when you change your payment gateway. This is expected. Read and accept them if they appear. 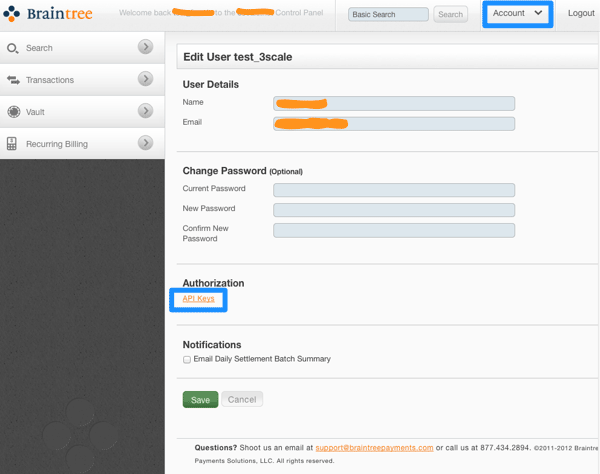 Your users should now be able to pay you using the Braintree gateway. In case your account is in the sandbox mode and you encounter any problems, you will have to change it to production. This guide will help you define a great workflow in your Developer Portal to ensure that developers submit their credit card details before they gain access to your paid API(s). It’s increasingly common to see businesses charge for access to their APIs. Sometimes the entire business model of a company is built around paid APIs, while other times it’s an important revenue stream to cover costs or generate profits for the company. After following the steps detailed below, all the existing developers who have paid plans but no credit card details entered, will be redirected to the credit card details form. They will not be allowed to access the portal until they have successfully entered their credit card details. 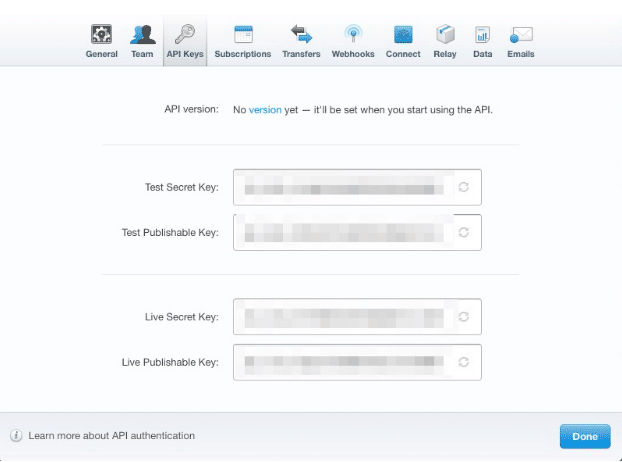 The developer gains access to their keys to start making calls on your API through the API credentials. The changes below ensure that you only display the links if the account does not require credit card details to be entered e.g because there are no paid plans or if the credit card is already available. If you wanted to be completely strict about this, you would edit the system page for displaying the keys to restrict the display – but this would be an advanced customization. You may also want to delete the snippet to display credentials directly on the home page after login. Again, if you have customised this partial already, you will need to modify your version accordingly using the same new liquid tag: current_account.requires_credit_card_now? 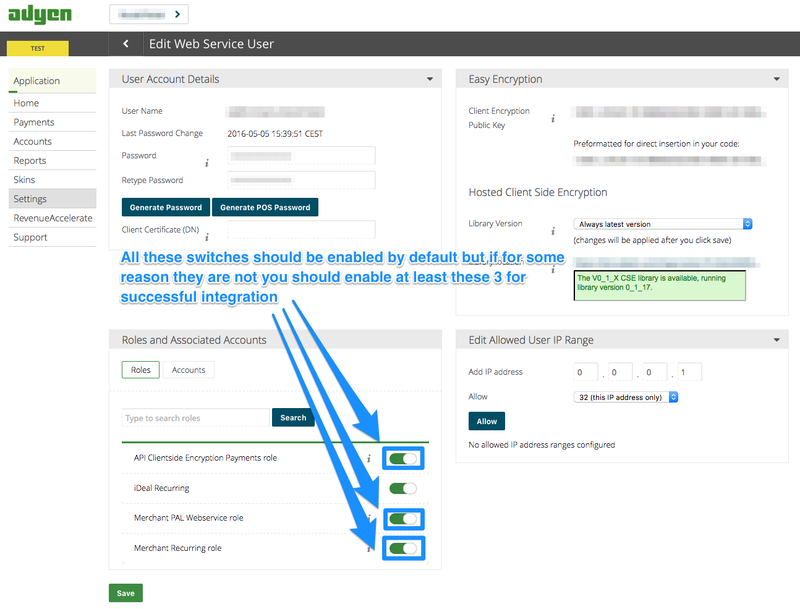 Switches can be found in Developer portal > Feature visibility. You may allow developers to select plans when changing plans. The ideal setting is Request credit card entry for paid plans. This will ensure that if a paid plan is selected, the plan change can only be done instantly if a credit card is stored. Otherwise a notification is displayed to point the developer to the location to enter their card details. This setting is defined from the Admin Portal. Go to API > Service > Settings > Application Plan Changing. Here you can select the option Request credit card entry for paid plans. If you have added the plan_widget in any other pages, you will need to update those to match the above snippet. Follow the same instructions above to change any instances of plan_widget in the applications/form partial to conform to the new snippet. And that’s it! 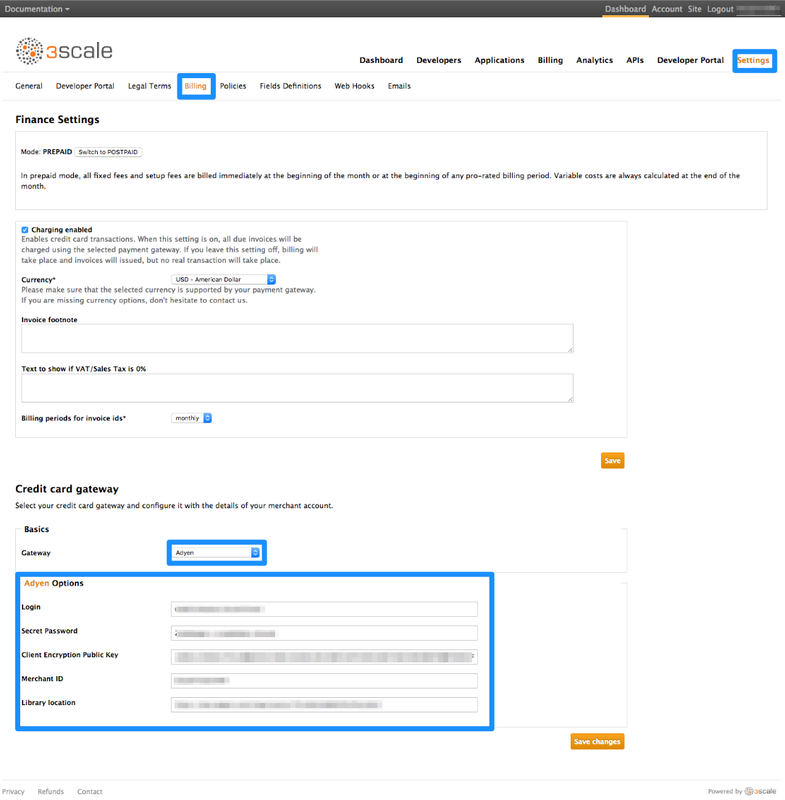 You can now enforce the addition of credit card details before allowing usage of your API for paid plans. After completing these steps you will have configured Stripe as a payment gateway for your account. This will allow your developers to enter their credit card details, and you can automatically charge them through Stripe for access to your API, according to the calculated invoices. If you enable credit card charging for your paid API, then one key step is to setup your payment gateway. There are a number of alternative payment gateways which you can use with your 3scale account. Here we cover the steps for Stripe. Before you start these steps, you will need to open an account with Stripe. Log in to your Stripe account, and get your API keys at https://dashboard.stripe.com/account/apikeys. You will need two keys: a "secret" one, and a "publishable" one. Use the "test" set when you’re doing tests and the "live" ones when you are ready to start charging. You should see a drop-down called Gateway near the bottom of the page. Change it to Stripe. The form below the drop-down should change to show two fields. Insert your Stripe API keys and click Save. You might see a couple of alerts when you change your payment gateway. This is expected. Read them and accept them if they appear. The payment gateway is now set up, but your users might not be able to use it yet since the it’s not configured in the CMS. Go to Developer portal, and click on the template called Payment Gateway / Show on the left navigation pane. Finally click Save and Publish. Your users should now be able to pay you using the Stripe gateway.